Location : In the state of Andhra Pradesh in the southern part of India. Tourist Attractions : Thousand Pillar Temple, Warangal Fort, Bhadra Kali Temple, Jain Temple, Kolanupaka, Sri Veeranarayana Temple, Pakhal Lake, Ramappa Temple, Kolanupaka Museum. Nearby Tourist Destinations : Hyderabad, Vishakhapatnam, Tirupati, Vijaywada. 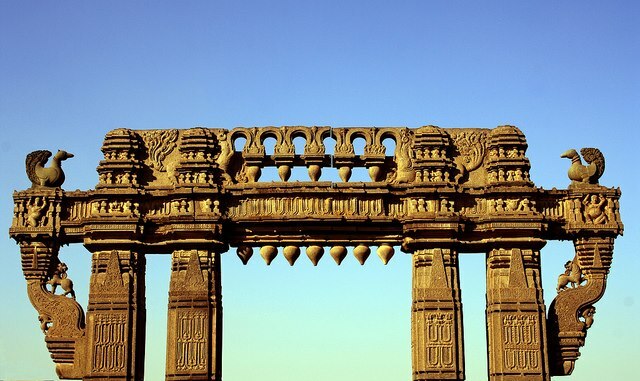 The historic city of Warangal in the state of Andhra Pradesh, 175 kms from Hyderabad, is known for its beautiful turquoise lakes, spectacular temples and rich flora and fauna. The Capital of erstwhile Kakatiya Kingdom, Warrangal is a place for those interested in Hindu temple architecture. Here in specimen of Kakatiya architecture-the star-shaped thousand pillars temple. This triple shrined temple dedicated to Shiva, Vishnu and Surya is noteworthy for its delicately carved pillars screens and exquisite icons. The rock cut elephants and the Nandi bull (1.8mts) are very impressive. The Bhadrakali temple atop a hill near Warrangal, which is noted for the eight armed stone image of the Goddess and the Warangal Fort are the places worth a visit. Warangal fort is 12-km from Hanamakonda, which dates back to the 13th century. This is a must see sight in Warrangal. This temple is one of the finest examples of Kakatiya architecture and sculpture. Rudra Deva built it in 1163 AD in the style of Chalukyan temples, star shaped and triple shrined. Situated on a hilltop between Hanamkonda and Warangal, it is noted for its stone image of the Goddess Kali. Kolanupaka, 80-km from Hyderabad, is situated between Hyderabad and Warangal. This was the second capital town of Kalyani Chalukyas during the 11th century AD. During this period the village was a religious centre of Jains, and ranks among other great Jain centers in the south. The temple is raised in the Chalukyan style around 1104 AD. A man-made lake built in 1213 AD by the Kakatiya king, Ganapathidev, by harnessing a small tributary of the Krishna River. It is located 50-km from Warangal and spreads over an area of 30-sq-km. Sculpture at Warangal FortRamappa Temple or Ramalingeswara temple, is situated in Palampet village, which is 70-km form Warangal. This is a beautiful monument dating back to 1213 AD. It displays the glory and richness of the Kakatiya kingdom. Kolanupaka came into influence when it was made the alternate capital of the Kalyani Chalukyas in the 11th century AD. The State Department of Archaeology and Museums established a sculptural gallery, which exhibits exquisite artifacts from the numerous historical monuments in Kolanupaka. Air : The nearest Airport is at Hyderabad (140-km) connected by Indian Airlines flights to all the major cities of India. Rail : Warangal is well connected to all the major cities in India by rail. Road : Regular bus services are available (APSRTC) from Hyderabad, Yadagirigutta, Vijayawada, Armur, Kolanupaka, Jangaon, Kodad, Karimnagar, Nizamabad, Adilabad, Suryapet, Palampet, Jagtial, Khammam, Bhadrachalam, Basara, Bangalore, Mysore and Tirupati. In order to make the travel tour to Warrangal even more joyful we offer just the right kind of accommodation for you and your family or friends in Warrangal. Accommodations offered are exactly made for you. There are numerous luxury, heritage, deluxe and budget hotels in Jodhpur. Just select the one which best suites you.